We’ve been discussing tangential velocity within the context of a pulley and belt assembly in recent blogs, and you may have wondered whether you encounter this phenomenon in your everyday life. Undoubtedly you have. Have you ever driven a long stretch of highway at a fast clip and suddenly come upon a curve in the road posted at a lower speed limit? If you happened not to notice the speed reduction, you may have found yourself slamming on the brakes to regain control of your car. You’ve been caught in a tangential velocity danger zone. As this road sign indicates, cyclists must also beware of potentially dangerous circumstances involving tangential velocity. 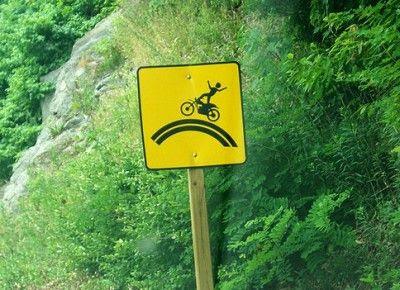 It warns of an upcoming drop in the road, which, depending on their speed, has the potential to catapult them into the air. Next time we’ll resume our discussion of tangential velocity and other factors within the context of our pulley-belt assembly.